I spent this past week playing what is currently the best-selling game in the world: the Japan only 3DS game Tomodachi Collection: New Life. After scouring the internet for Miis to populate the game, I spent my first three hours with the game in a state of nostalgic, yet amused, bafflement. My extra hours with the game have done little to change my original opinion: it is a crazy random game designed from the bottom up to take as much of your time as possible. So much of Tomodachi Collection is truly random. As you play, you are constantly interrupted by a news program using your Miis to showcase your latest unlocked areas and events. In my case this was anything from the Lara Croft opening of a new hat store to the Joker reporting live on events from downtown. And the more Miis you import, the more they want to pair off and become friends—or even lovers and make children. If their first meeting goes well, you may even be treated to a scene of your stalking them on their first date. But neither the news nor dating scenes compare with the complete insanity of the Miis' dreams. Sometimes you enter a psuedo-mini-game. In one such, about ten of my Miis were hiding under a cup; when I lifted it, they scampered to hide under a different one. Other times, you are treated to a bizarre use of the 3DS's camera. 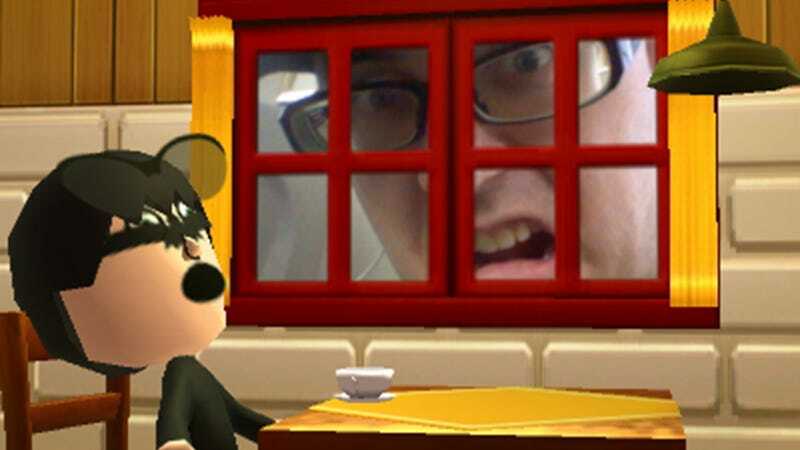 Once when a Mii was eating breakfast (in a dream), the curtains opened to reveal a live feed from the 3DS camera of me looking in at him. It was a random, silly, and somewhat creepy moment. Unlike many other life simulator games, there is no downtime to be found in Tomodachi Collection if you have enough Miis collected. Sometimes one of them will need something—a hat, some clothes, some food, or a new set of furniture—and you head out and buy it for them. Other times they will ask you to play a short mini-game to win a special item from them. I spent a lot of time playing catch, playing memory, and trying to see through heavily pixelated censoring to decipher what the covered image really was. And as I mentioned above, the rest of my time was spent invading dreams, watching the Mii news, or spying on my friends while they went out on dates. In other words, I never felt like I was running out of things to do. In some ways, Tomodachi Collection feels more like an addictive social game than anything else. You are given rewards each day you visit your town and there are many events you won't see until you have spent several weeks (or more) with the game. While events and mini-games are plentiful, they are also short—making this a great game to pick up if you only have five or ten minutes to play. Of course, this means that if you, like me, would rather sit down and power through a game in long chunks, there is much of the game you may miss. Moreover, there is enough repetition in quests and mini-games that things do feel more than a bit boring when played in long stretches. Bad – What’s The Point? While I was having fun playing Tomodachi Collection, one question kept popping into my head: “What's the point?” True, there always seemed to be more than enough to do, but I really felt like there was no overall goal to keep me motivated while playing. It may be fun to set up Doc Brown and Princess Zelda on a date (and eventually seeing their child if it all works out), but it's hardly a driving force to keep me coming back for more. Without a defined goal, I found myself getting bored with the game even as I enjoyed the randomness the game presents. On one hand, Tomodachi Collection: New Life is a cute, random game that often succeeds at bringing a smile to your face. On the other, it's a long, repetitive game with no real goal other than to have fun while playing it. While I enjoyed it for what it was, it was a game that felt too much like wasting time for the sake of wasting time for me to enjoy it much past the first few hours. But if you are one who loves addictive social games or other life simulators like Animal Crossing or The Sims, you will likely find plenty of fun to be had in Tomodachi Collection. Tomodachi Collection: New Life was released on April 18, 2013, for the 3DS in Japan. There is currently no word on an international release.